Lock up your jewelery and valuables with a fun and stylish case. 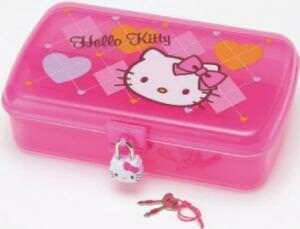 This is a reall cool lock box that features the popular feline Hello Kitty, a head shot of her wearing her pink bow is on top along with an argyle pattern and some hearts in the background. 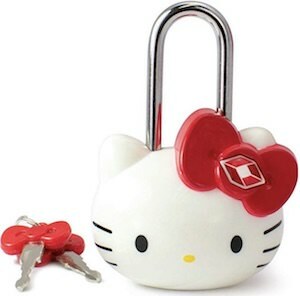 The lock is absolutely awsome, it is a Hello Kitty head shaped lock with …… of course a pink bow and comes with two keys. A very durable plastic case that measures Height 2-1/4 inch x Length 5-1/2 inch x Width 8-1/2 inch. See more about the Hello Kitty Case with Lock. Having a school and / or gym locker brings a lot of responsibilities. You of course want it to look cool and hip without making it scream at others. That is why you need a cool lock. This Hannah Montana lock will do the trick because Hannah is cool and this look is awesome. Elmer’s makes this Lock’em Hannah Montana lock and that stands for quality. Then of course the lock is a combination lock so no need to have a key (that you can loose) just remember the combination and you are good to go. And if you don’t have a locker then just think of all those other things you could lock if you had a cool lock like this one. Start your trip to coolness with this Hannah Montana Combination Lock.